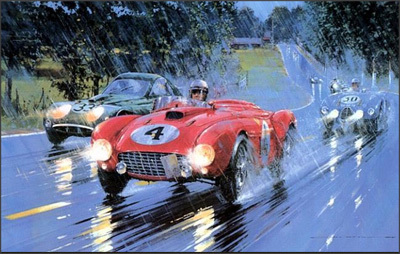 With its headlights blazing, the victorious Ferrari 375-Plus of Gonzales and Trintignant leads the Bristol 450 of Fairman and Wisdom and the Gordini T30S of Pollet and Guelfi onto the Mulsanne straight during the wet conditions of Sunday afternoon. The Gordini was to win the 3 litre class, whilst the Bristol team secured the 2 litre class. Following is the second placed Jaguar D-type of Rolt and Hamilton and the DB-Panhard of Bonnet and Bayol. The race had been a titanic struggle between Ferrari and Jaguar for overall victory, and ended with the smallest winning margin since 1933.